Legendary Italian delicatessen Lina Stores has been a Soho institution since 1944, with many an ardent pasta fan making a pilgrimage to its Brewer Street corner site. Now, almost 75 years later, the owners have opened a restaurant a few blocks away on Greek Street. Architects Red Deer, unsurprisingly, took their cues from the original store, echoing its distinctive pistachio green-tiled, black and white facade in the new space’s interior and exterior colour palette. 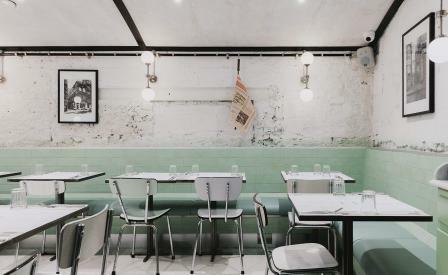 Diners are greeted by a mosaic floor embedded with the restaurant’s name, a green- and white-striped awning, and pale green cement tiles, leading into the two storey 53-seat space. Art deco aesthetics flow through the ground floor 12-seater bar, with its sleek aluminium and formica countertop, padded green leather stools, fluted glass panels and globe lighting, and continue downstairs into the intimate basement restaurant, which sports a vaulted ceiling and raw whitewashed walls. Graphics, meanwhile, are by London design agency Everything in Between, who added a neat touch to the tiny tables, inlaying each corner with the letters of the restaurant’s name.